City Police in Georgetown said they Thursday night found a rifle in the possession of a hooded man under the Stabroek Market canopy who escaped. Chief Constable Andrew Foo said Friday morning that due to the prevalence of narco-trafficking and the fact that the area under the clock is a haven for criminals, the constabulary has recommended that vendors be eventually removed from that area. Foo said if the recommendation is accepted, vendors would be removed when new areas are found for them to be relocated. City Hall has already drafted a number of plans to accommodate vendors at Stabroek and Bourda areas. Assistant Superintendent of the City Constabulary, Gordon Langevine said intelligence led city police to search a bag that was found in the posession of a male East Indian. He said the man escaped, leaving behind the disassembled firearm in the bag. No ammunition accompanied the firearm. City Police plan to hand over the weapon to the Guyana Police Force for checks and ballistic tests. 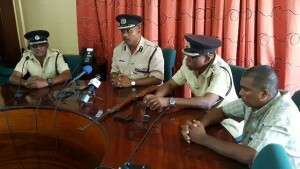 Langevine said the crackdown against criminals who use the area late at night and early morning to rob persons and sell drugs would intensify. “It’s time we rid the Stabroek Market of these elemenrs because these elements use the market by night to carry out their criminal activities,” Langevine said. Town Clerk, Royston King is expected to meet with vendors outside Stabroek Market Thursday afternoon.